HOTEL CHAINS AREN’T THRILLED about Airbnb these days, and with good reason. The service allows travelers to meet new people, stay in unique accommodations, and enjoy many of the same amenities that hotels provide (plus many more). And if you’re lucky, your host might even cook a meal for you. Take a look at the site for yourself — if you’re anything like me, you’ll probably find yourself browsing potential stays for hours on end. But first — check out 12 of our favorite Airbnbs in Rome, from a 377-square-foot modern flat to a 2,250-square-foot 16th-century apartment. This 2,250-square-foot apartment, named “The Turtle’s Dream” (it overlooks Turtle Fountain), channels royalty in every aspect. Its 16th-century coffered wooden ceiling contains 168 hand-painted drawings of different bird species. 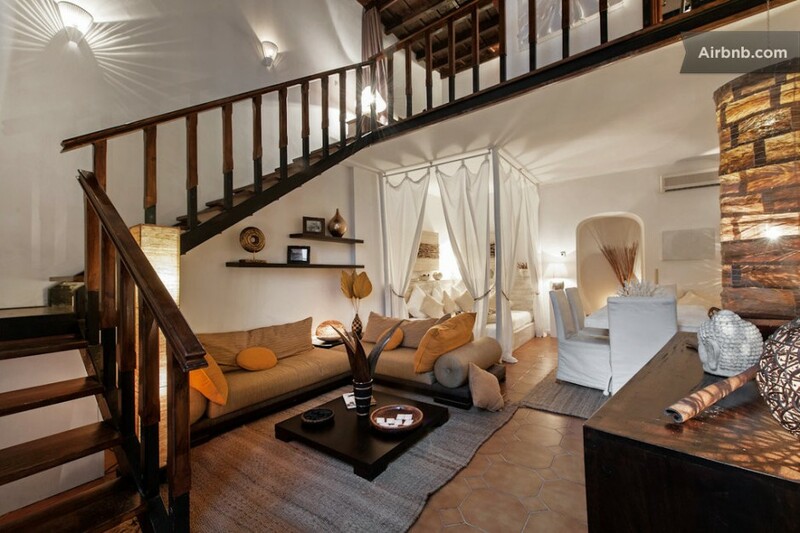 Sitting in Palazzo Costaguti, the four-bedroom apartment has two terraces that are ideal for dining or lounging. With that said, visitors might not want to leave the house if they decide to stay here. 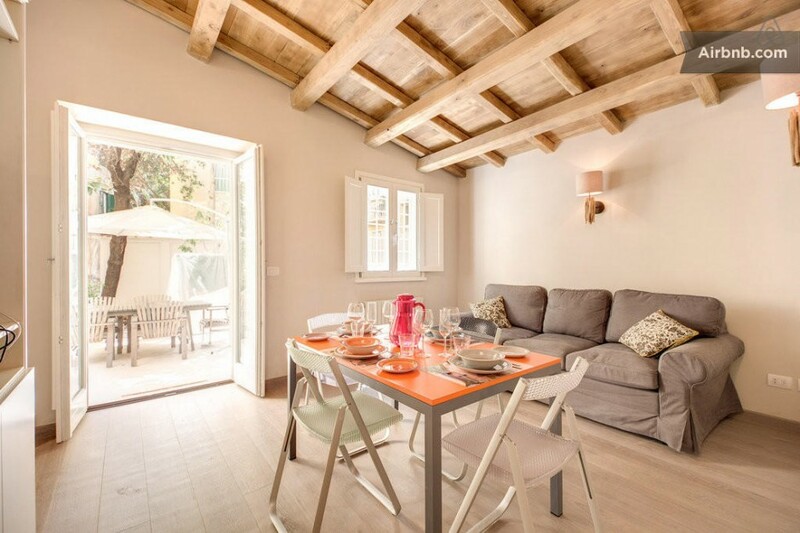 The central location of this two-story apartment allows quick access to many of Rome’s tourist attractions including the Colosseum, Trevi Fountain, and St. Peter’s Basilica. Seen in the corner is a “romantic alcove,” which is a rather accurate description considering the white canopy concealing the bed (add flower petals for extra effect). Every detail contributes to the romantic getaway effect, from the lighting to the subtle touches (including white brick, a coral centerpiece, and metal wine cooler waiting to be used). With an exposed brick ceiling and instruments (mostly string, if you were wondering) adorning the walls, this 3rd-floor apartment gives vibes of a (small) old concert hall. An interior designer decorated the apartment—and it shows, from the wooden cabinets to the large clock on the table. There’s also an elevator in the building for those who aren’t too fond of stairs. Oh, and there’s a balcony! A stone’s throw from the Colosseum, this villa in Rome ("Villa Schatzy") sleeps eight people in four beds thanks to the sofa bed. The crown jewel of the villa is its garden, ideal for enjoying a coffee in the morning before spending a long day touring the city. The subtle touches, from the dining-room table to the chandelier, bring colors to the apartment. If you’re looking for modern in the middle of an ancient city, Villa Schatzy isn’t such a bad place to look. 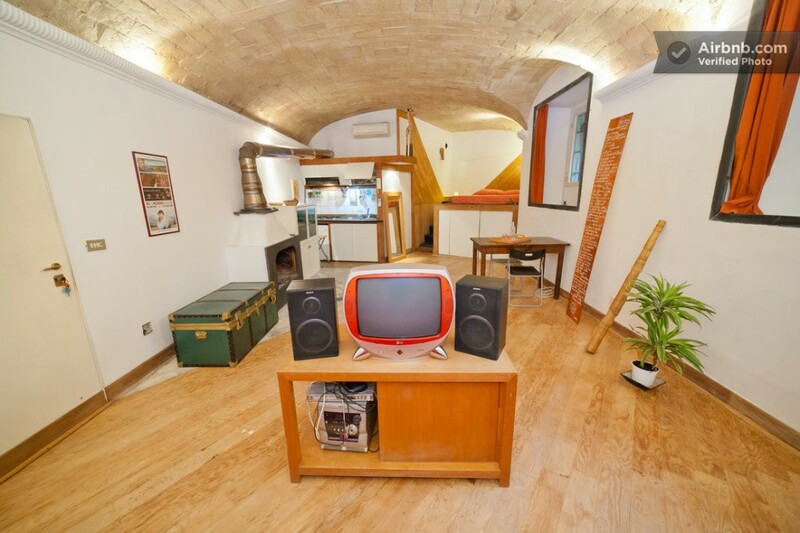 From the inside, this Trastevere apartment appears to be a chic shelter built to withstand a nuclear winter. The curved ceiling is one of the apartment’s most notable characteristics. The basement apartment has a fireplace—always a bonus for cold nights. And if you do happen to get cabin fever from being halfway underground, you can step outside onto the terrace to take in the view of Gianicolo Hill. Apartment aside, fingers crossed for no nuclear winters. 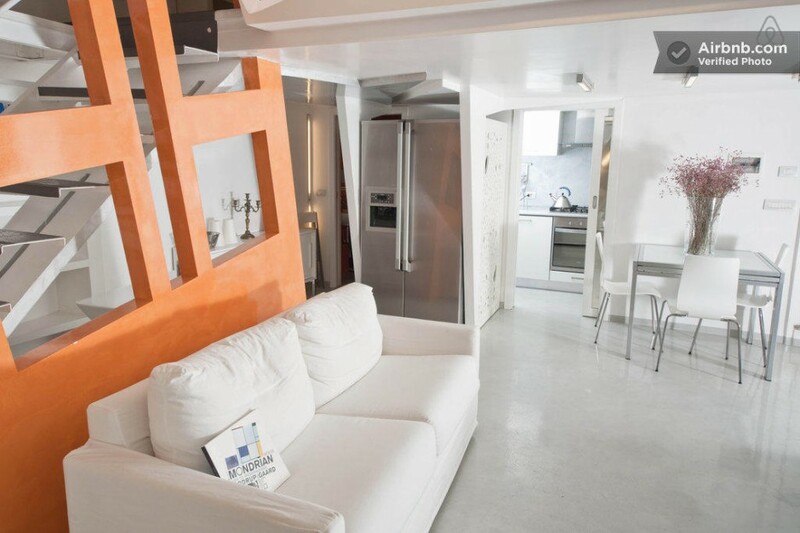 Located in Piazza Navona, this apartment looks more like it belongs in a Prometheus scene than it does Rome. With walls clad in shades of white and gray, the apartment takes on a futuristic, modern tone (though it happens to overlook a historic courtyard). It might be a small shock stepping out of your mini-spaceship into an area that dates back to 1 AD. Worth it. 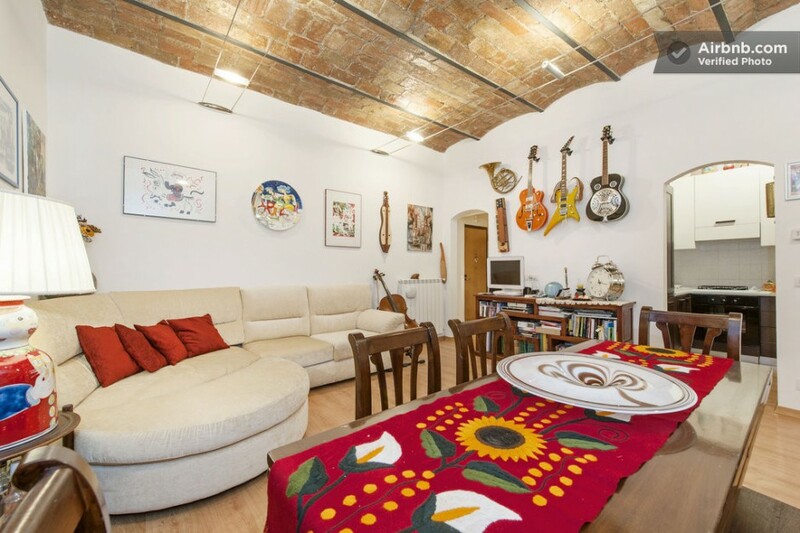 The interesting décor of this Trastevere flat will keep visitors entertained, from the upright bass-shaped table to the triangular (and rectangular) lights to the fish tank built into the staircase. 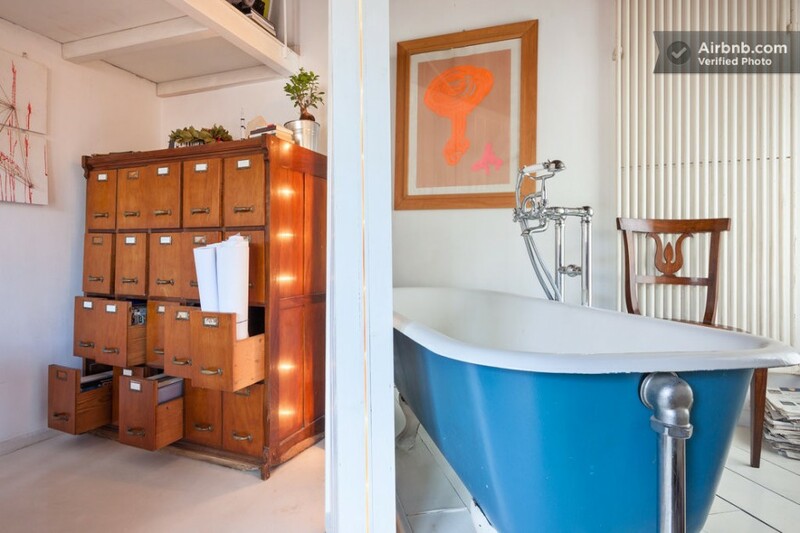 While smaller than most apartments at 377 square feet, the apartment seemingly even makes showers exciting thanks to the detailed tiles and colorful light fixtures. 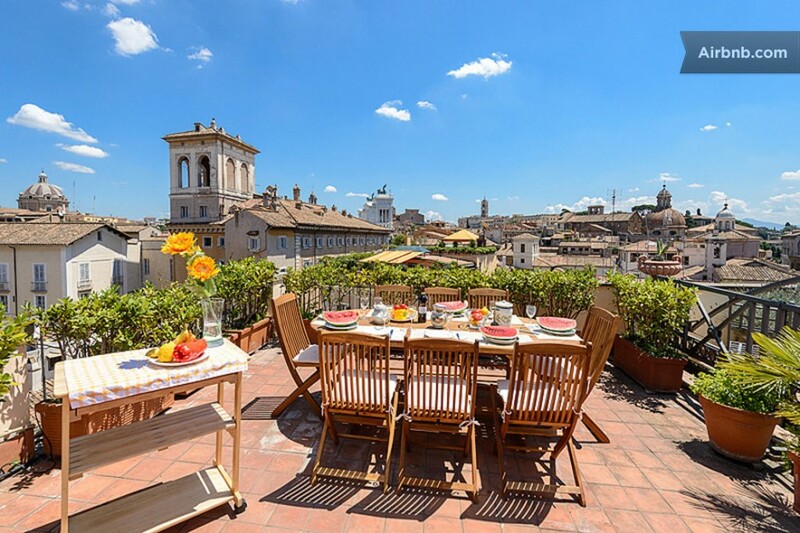 This Rome apartment is located between several of the city’s most popular piazzas, and its view assures you won’t forget. The clean, white interior and wood accents of the two-bedroom apartment will likely give you the feeling of waking up in the middle of an Anthropologie photo shoot. Chances are you’ll be spending more time on the balcony than you will inside the apartment, though. While the apartment has classic white walls and wooden beams (considered classic for good reason), the red chandelier, blue claw foot tub, spiral staircase, and intriguing art around the house add lively tones. 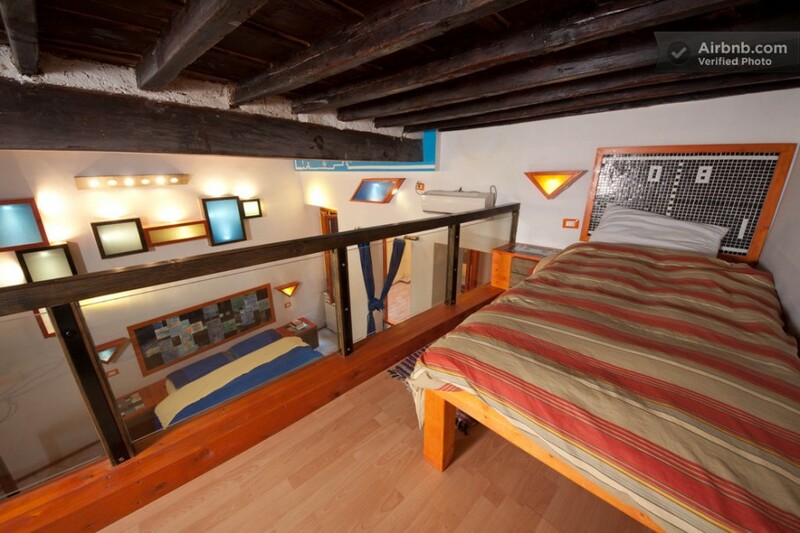 The apartment contains two lofts which house two double beds, and also has a sofa bed to sleep a fifth person. It may or may not be that easy to get your sightseeing done, considering you can just lie in the tub and read a book instead. 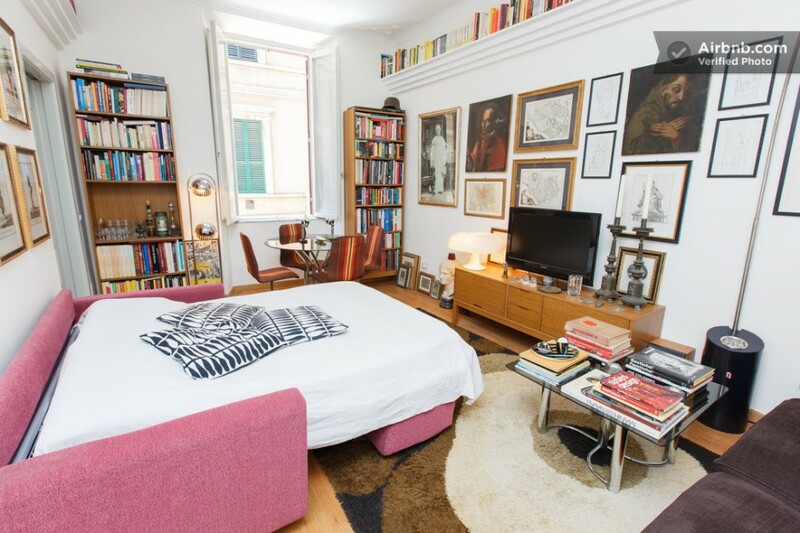 Located between Campo de Fiori and Piazza Navona, this Sant’Eustachio flat looks like it belongs on the pages of an interior design magazine. While the flat in its barebones form appears to have plenty of potential, the furniture and décor give the apartment its character (take a look at the potted plants, hanging clock, and “Cuisine” script on the wall). Oh, and the second-floor views give visitors a close-up look of the action on the street. 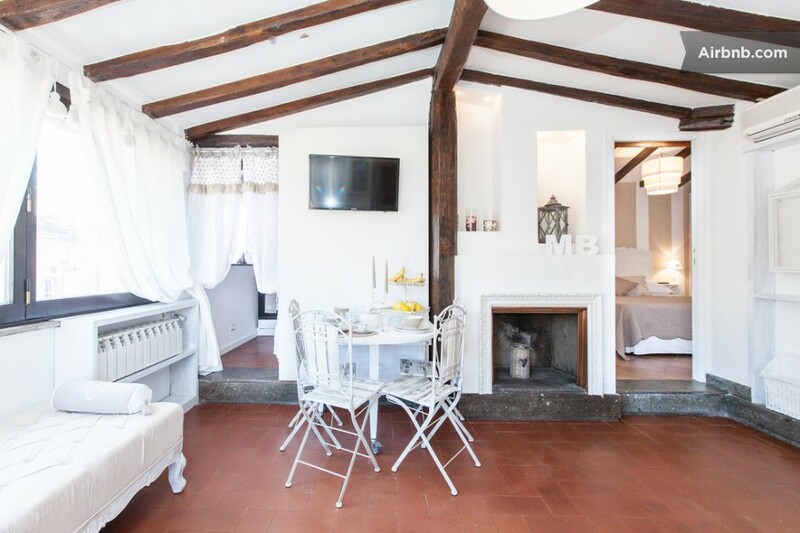 Overlooking Borgo Pio, Rione Borgo’s main thoroughfare, this rustic bed and breakfast transports visitors to a different time. And it comes with an Italian breakfast and daily room cleaning as well. The hosts will have no problem pointing you to the right place if you want to grab a bite to eat, down a drink or ten, or discover an off-the-beaten-path destination. 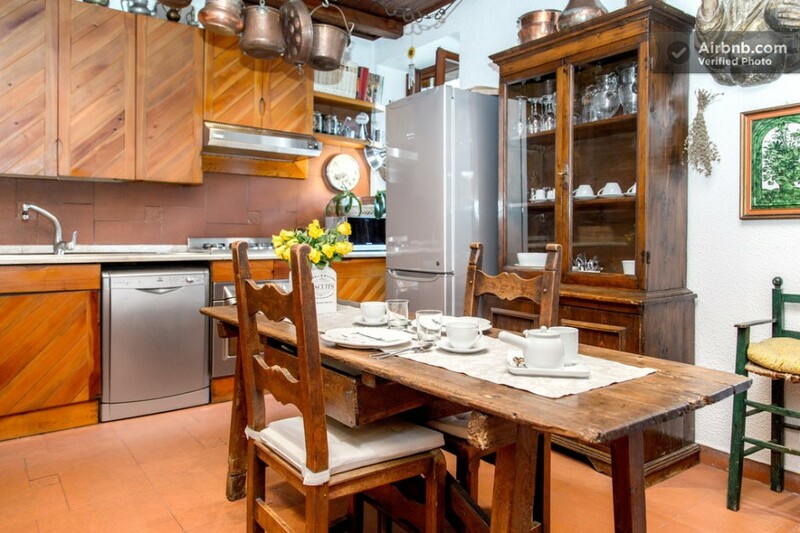 Oh, and the kitchen might make you feel as if you’re in the Italian countryside. Beats staying in a hotel. Located near the Spanish Steps, this 17th-century home is a mix of modern and classic, from the art to the fixtures. While the furniture and accommodations aren’t meant for a king, the house makes up for it ten-fold with its charm. Check out the interesting tiles, candle fixture, seemingly from an older time. Walk into the bathroom and spend a while wondering when it was built. This house needs its own tour guide.